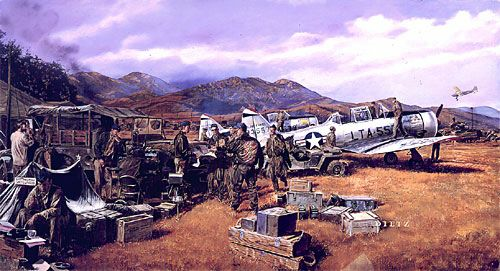 James Dietz Handsigned and Numbered Limited Edition Print:"Out On A Limb"
About the Art: The 6147th Tactical Control Group, nicknamed the "Mosquitos", received a Presidential citation in 1951 for their performance in the Korean War. This citation was for the entire unit and without parallel in aerial warfare history at that time. The gallant Mosquito pilots flew unarmed and unescorted T-6 aircraft that were vulnerable to opposition from the air and ground. Yet these brave pilots flew at dangerously low altitudes over Communist positions searching for telltale signs of the enemies presence: freshly turned earth, footprints in the snow or a discarded tin can. Once a sign was spotted, the Mosquitos flew down into the flak and marked their targets with smoke rockets. The North Koreans called them "Mosquitos" because the sight of a North American T-6 buzzing down on them meant they were soon to be "stung". Shortly after the annoying buzz of the venerable Texan ceased, the screams of rocket-laden P-51s or the new jet fighter, F-84 Thunderstreak, were on their way downhill to deliver death and destruction to the Communist supply lines. The T-6 tactical coordinators of the 6147th Tactical Control Group may have been old and outdated, but as deadly hunting dogs that pinpointed game for heavily armed aerial hunters, they were universally feared by the enemy. The speed of the fast fighter/bombers, particularly the jets, did not allow the pilots to adequately see and target the highly camouflaged positions and vehicles of the North Koreans. They needed small, slow yet maneuverable aircraft with an observer who could mark the enemy positions with smoke bombs or rockets. The T-6 was fast enough to evade enemy attacks, had adequate visibility to truly observe targets, could be equipped with the necessary communications gear (eight-channel AN/ARC3 radio sets) to talk the fighter/bombers into targets and could carry target rockets to mark sites. The men called to fly these missions lived a kind of gypsy life, they were moved from air base to airbase as the U.N. forces retreated southward from the North Korean flood. They were quite literally "Out On A Limb", not only needing to complete their operational objectives in the air, but also having to leave the ground staff of the group to move all their equipment to the next airfield down the line. We have largely forgotten the role of these daredevils in the T-6, but without the "Mosquitos" - a raging outfit of professionals of one stripe or another - the Korean air war might have been a different story. By the end of the Korean War, the 6147th Tactical Control Group lost 42 aircraft and 33 men. The Mosquitos flew over 40,000 sorties aiding in the destruction of 5 tank divisions, 563 artillery pieces, 5,079 vehicles, 12 locomotives, and 84 bridges.